Imang Salud Ensaimadas featured in "Panaderia: Philippine Bread, Biscuit and Bakery Traditions"
Imang Salud Ensaimadas is featured in the new book "Panaderia: Philippine Bread, Biscuit and Bakery Traditions," a comprehensive documentation of the stories behind the making of Philippine bread published by Anvil Publishing, Inc. Get your copies now! "If pan de sal is our daily bread, ensaymada is the bread we indulge in." 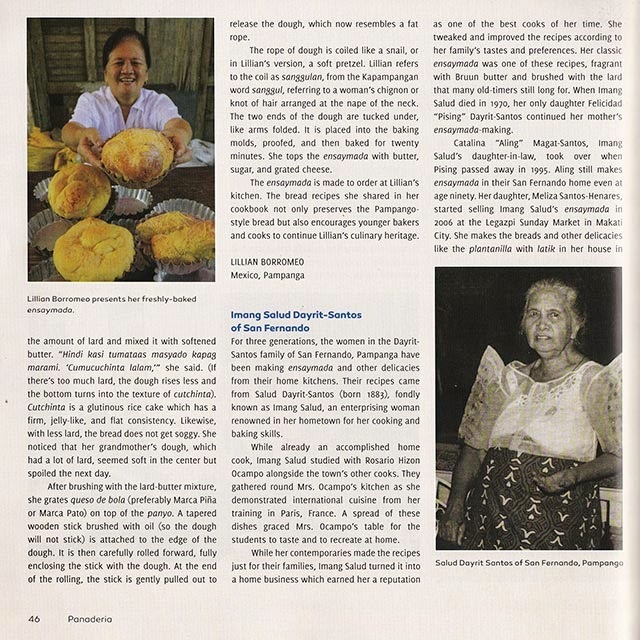 For three generations, the women in the Dayrit-Santos family of San Fernando, Pampanga have been making ensaymada and other delicacies from their home kitchens. Their recipes came from Salud Dayrit-Santos (born 1883), fondly known as Imang Salud, an enterprising woman renowned in her hometown for her cooking and baking skills. While already an accomplished home cook, Imang Salud studied with Rosario Hizon Ocampo alongside the town's other cooks. They gathered round Mrs. Ocampo's kitchen as she demonstrated international cuisine from her training in Paris, France. A spread of these dishes graced Mrs. Ocampo's table for the students to taste and to recreate at home. While her contemporaries made the recipes just for their families, Imang Salud turned it into a home business which earned her a reputation as one of the best cooks of her time. She tweaked and improved the recipes based on her family's tastes and preferences. Her classic ensaymada was one of these recipes, fragrant with Bruun butter and brushed with the lard that many old-timers still long for. When Imang Salud died in 1970, her only daughter Felicidad "Pising" Dayrit Santos continued her mother's ensaymada-making. Catalina "Aling" Magat-Santos, Imang Salud's daughter-in-law, took over when Pising passed away in 1995. Aling still makes ensaymada in their San Fernando home oven even at age ninety. 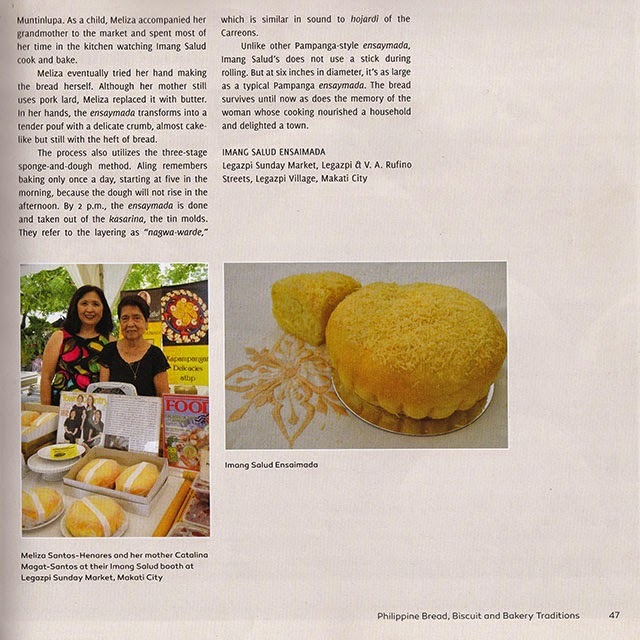 Her daughter, Meliza Santos-Henares started selling Imang Salud's ensaymada in 2006 at the Legazpi Sunday Market. 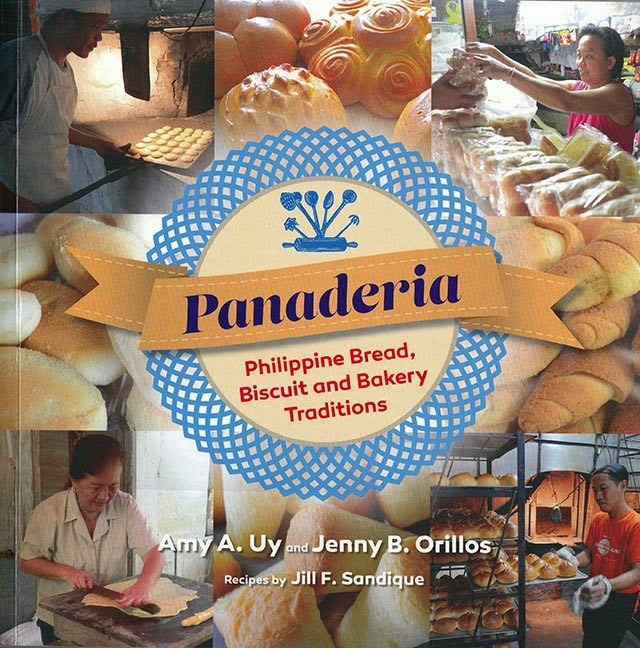 She makes the breads and other delicacies like plantanilla with latik in her house in Muntinlupa. As a child, Meliza accompanied her grandmother to the market and spent most of her time in the kitchen watching Imang Salud cook and bake. Meliza eventually tried her hand making the bread herself. Although her mother still uses pork lard, Meliza replaced it with butter. In her hands, the ensaymada transforms into a tender pouf with a delicate crumb, almost cake-like but still the the heft of bread. The process also utilizes the three-stage sponge-and-dough method. Aling remembers baking only once a day, starting a five in the morning, because the dough will not rise in the afternoon. By 2 p.m., the ensaymada is done and taken out of the kasarina, the tin molds. They refer to the layering as "nagwa-warde," which is similar in sound to hojardi of the Carreons. Unlike other Pampanga-style ensaymada, Imang Salud's does not use a stick during rolling. But at six inches in diameter, it's as large as a typical Pampanga ensaymada. The bread survives until now as does the memory of the woman whose cooking nourished a household and a delighted town. 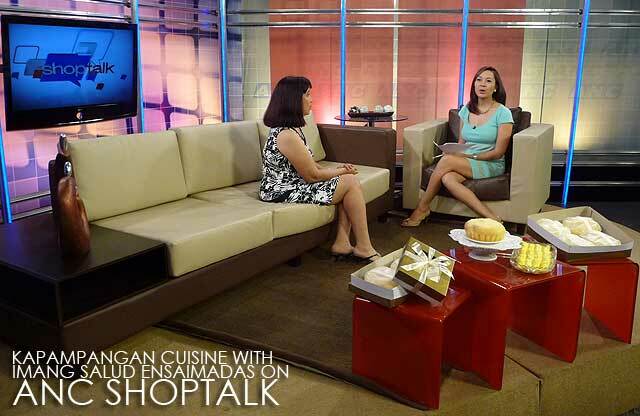 Imang Salud ensaimadas and plantanillas were featured on ANC Shoptalk today, March 9, 2011. In the photo is Meliza Santos-Henares, granddaughter of Imang Salud, being intervied by Ria Tanjuatco-Trillo. Incidentally, today is also the 88th birthday of Catalina Magat-Santos (Lola Aling), who continues to bake ensaimadas and other goodies in San Fernando, Pampanga. Happy birthday Lola Aling! 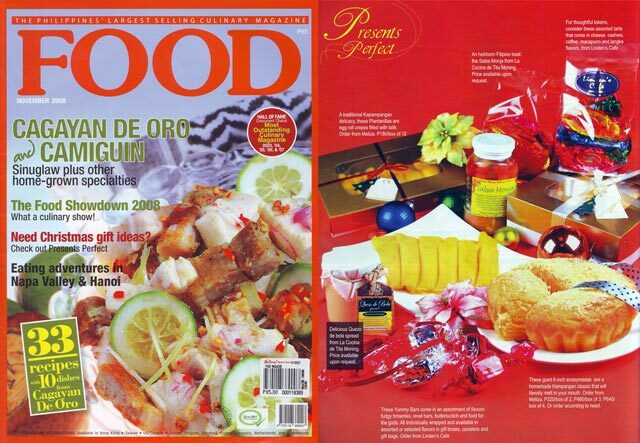 Imang Salud ensaimadas and plantanillas (sweet egg crepes with latik filling) were recently featured in the November 2008 issue of Food Magazine as gift ideas for Christmas. The six-inch traditional Kapampangan ensaimadas are P165/box of 1, P320/box of 2, P480/box of 3 and P640/box of 4. While the plantanillas are P180/box of 12. They are available every Sunday at the Legazpi Sunday Market. Just look for the Imang Salud stall. Text (0920) 9478819 for orders or more information. Sunday, 7:30 a.m. to 2 p.m.
Just recently, my sister Nina was raving about the one she tried at Legazpi Market. I had to sample this. Kapampangan Homemade Ensaimadas is an heirloom recipe of Salud Dayrit-Santos. These are gigantic ensaymadas that are worth a visit. They are soft, light, delicious and not fattening. Topped with queso de bola, they are what we refer to as espesyal. They offer this goodie at the Legazpi Sunday Market in Makati at the Legazpi car park. I love ensaymadas that are prepared well. This is one of them. Sometime ago, at a 5-star hotel food festival, we were served the most delicious ensaymada. Well, we found it here in the Sunday market and it is called Kapampangan Classic Ensaymada which melts in the mouth with a rich buttery taste. Melisa mans the store and she explained that the family has preserved the recipe of their lola, Inang Salud Dayrit Santos of San Fernando, Pampanga. They also have plantanilla, which are egg rolls with latik. It literally melts in your mouth in softness, a yummy buttery taste and topped with generous servings of queso de bola. One of the [Ultimate Philippines tour] participants had an Anton Ego' Ratatouille experience when he took a bite of the ensaymada. Flashes of childhood memories flooded his head and he raved about it throughout the tour. Market goers and pastry lovers must have heard of Imang Salud. 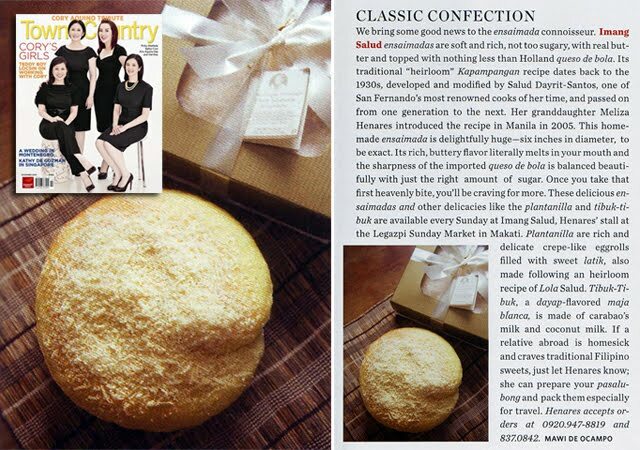 Most probably, you've heard of her melt-in-your-mouth giant Ensaymada that traces back to its roots in Pampanga. What you might not know yet is that there's more great finds at Imang Salud's food stall at the Legazpi Market. Presenting the Plantanilla. A sweet coconut dessert that looks like a mini eggroll. It's a true delight for your taste buds and can be very addicting too! It reminds me of Yema minus the sweetness that can make you cringe. I love taking the crunch of the latik inside the soft crepe-like wrapper. It's your authentic Kapampangan dessert that can be a wonderful gift for balikbayans or for your own personal consumption.